From the very first question Mr. Bury launched, it was clear, however, that he was not interested in the truth, and that I would not fare any better than someone who consents to go on Bill O'Reilly's or Glenn Beck's show. 2) Bury did not let me answer any of his questions, but repeatedly cut me off after I got only a couple words out. He asked totally leading questions using loaded terms with pejorative connotations like "conspiracy" in connection with the search for facts and evidence. Within a couple minutes, it was clear that Nightline's Chris Bury was only interested in furthering his pre-determined agenda and conducting a hit type interrogation just as Bill O'Reilly, Rush Limbaugh and other radio-TV talk shows are fond of doing. 3) Of course Chris Bury and his Nightline crew did not stay to hear my presentation on the terrible consequences of the lack of 9-11 truth -- the series of post 9-11 mistakes -- nor did they stay to hear any of the other speakers. It's been said that "truth is the first casualty of war" and there were many other visual displays and speakers, like myself, who made that point about why the truth matters. In fact when I tried to counter Bury's disparaging line of questioning, by asking why and how it came to be when Bush-Cheney launched their preemptive invasion of Iraq, that 70% of Americans mistakenly believed that Saddam was behind 9-11, Bury did not answer. Nightline edited out my questions of course about this massive deception as well as the rest of my interview in what they chose to air. 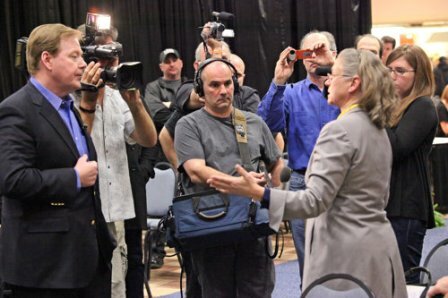 5) If Chris Bury and his ABC producer had attended the full two days of this conference, they would have failed to find one single call for violence in any of the presentations. They would have found just the opposite. Of course that would have conflicted with Nightline's sensationalist angle, stretching to connect the young troubled Pentagon shooter to calls for further investigation of 9-11. Their outrageous proposition was that anyone who asks questions about the momentously tragic event is dangerous. For many years, I've had this little magnet on my refrigerator with a picture of Mahatma Gandhi which says "Truth is the highest God." What that means to me is that although it's impossible to fully know the truth (as it is to know "God"), truth is a very worthy pursuit! So maybe it wouldn't do much good but we ought to send some of these refrigerator magnets to Bill O'Reilly, Rush Limbaugh, and all those sensationalist Gonzo journalists like Chris Bury to remind them not to forsake their own integrity and their 4th estate responsibilities. The truth really does matter.